Suchitra Karthik (L), Dhanush with Trisha (Centre) and Anirudh with Andrea. 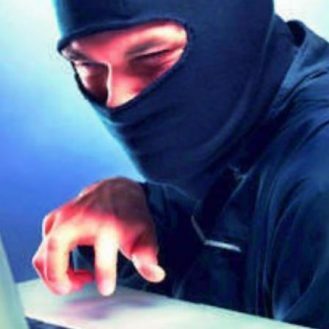 Mumbai: Cyber crime could be extremely menacing, especially when you are always in the spotlight and an alleged internet bully leaks your private pictures on social media. Now, the people in question are superstars of South Indian film industry- Dhanush, Trisha Krishnan, Hansika Motwani, Anirudh Ravichander. 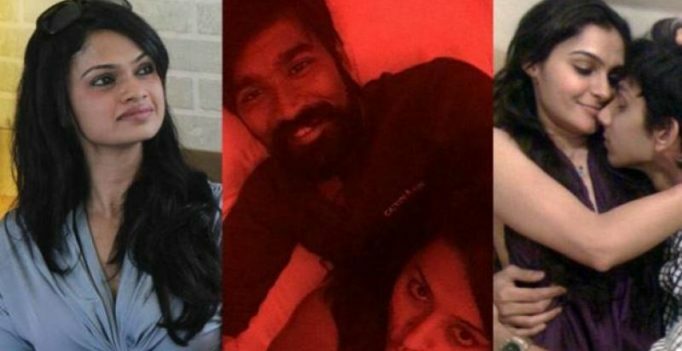 These pictures of the stars, some of them snapped in an inebriated state, were uploaded from singer Suchitra Karthik’s Twitter account, who is rumoured to be at loggerheads with Dhanush. 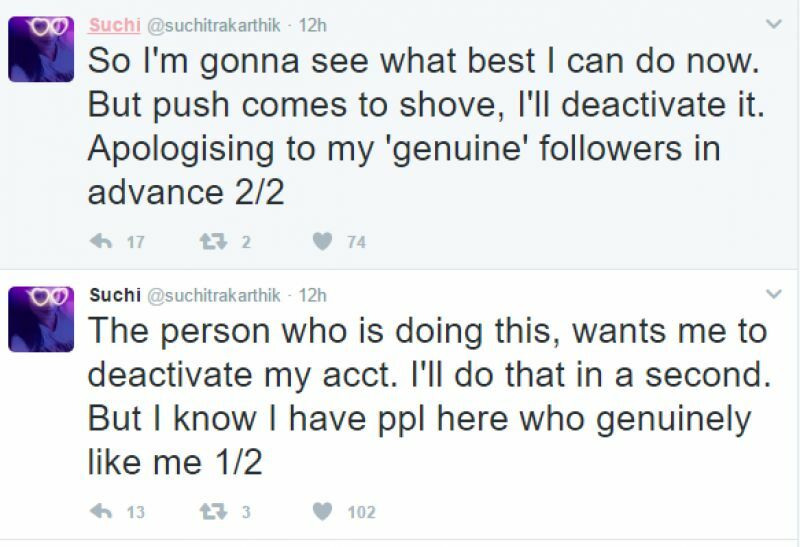 However, minutes after uploading the photos, Suchitra deleted the snaps and has clarified that her account was yet again hacked. 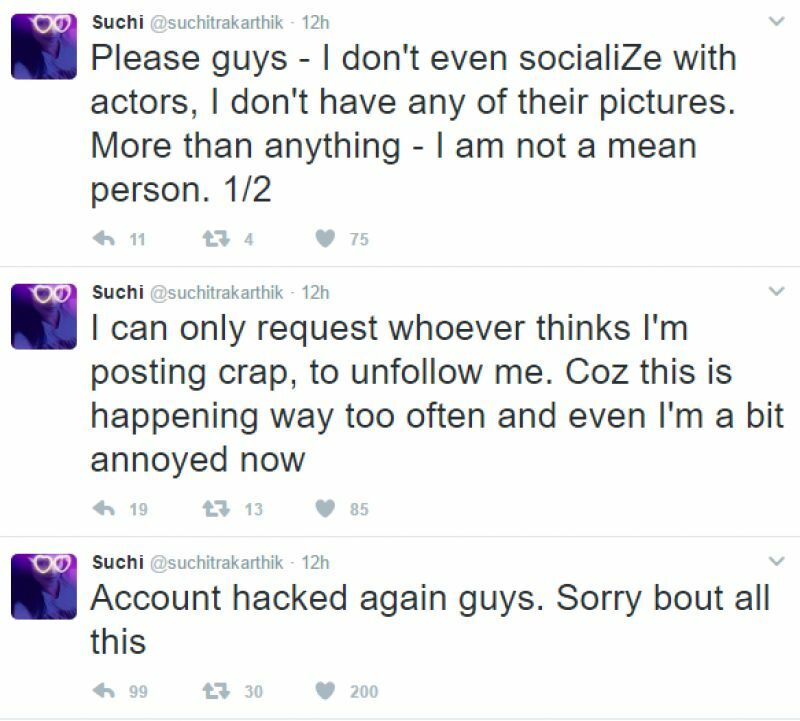 She wrote: Account hacked again guys. Sorry bout all this. I can only request whoever thinks I’m posting crap, to unfollow me. Coz this is happening way too often and even I’m a bit annoyed now. “Please guys – I don’t even socialiZe with actors, I don’t have any of their pictures. More than anything – I am not a mean person. The person who is doing this, wants me to deactivate my acct. I’ll do that in a second. But I know I have ppl here who genuinely like me,” added the singer who cleared her name in a series of tweets without apologising to the stars whose pictures the alleged hacker leaked online. 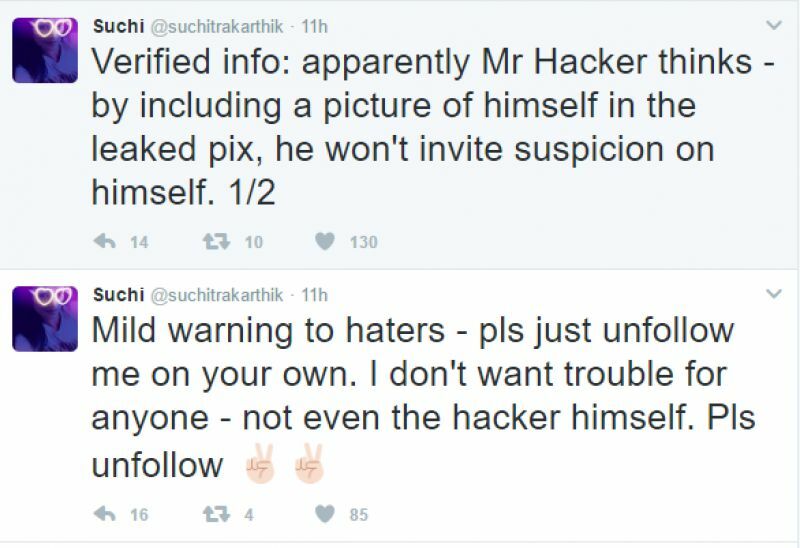 Suchitra also insinuated that the hacker is one of the actors from those pictures. “Verified info: apparently Mr Hacker thinks – by including a picture of himself in the leaked pix, he won’t invite suspicion on himself. ½,” she wrote.